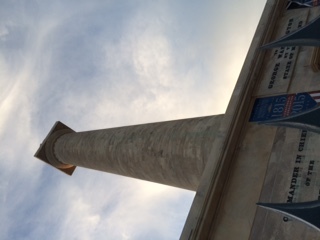 Baltimore’s Washington Monument has 227 steps winding up a tight spiral to the top. In the previous post, I chronicled my somewhat daunting climb. However, coming down was way scarier, particularly for someone who has a tendency to twist her ankles. 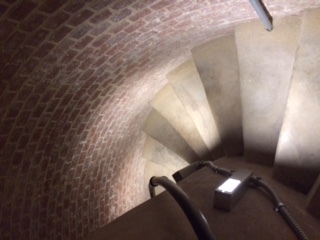 I kept a tight grip on the railing while descending the stone stairs of the column, turning tightly down 13 stories. Yikes. After successfully arriving on the ground floor, I took some time to explore. There is “colossal” sculpture of George Washington, first installed in 1843. 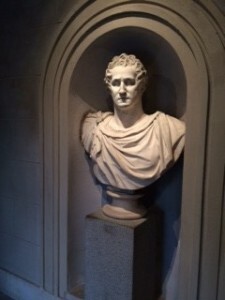 He’s portrayed as “a classical hero in Roman dress,” according to the sign. (While the monument was being restored, this Washington bust took up residence in the Sculpture Court at the neighboring Walters Art Museum). 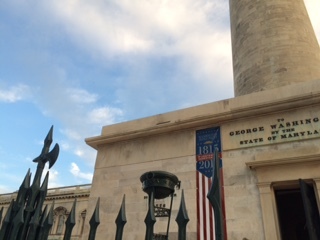 A large plaque (I am guessing bronze), commemorating the 100th anniversary of the monument, proudly proclaims that “This monument is the first erected by any city or state in honor of George Washington.” It also provides some history on the monument (including its funding) and its connection to the Masons. 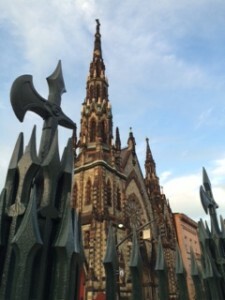 There is also information about the more recent restoration. 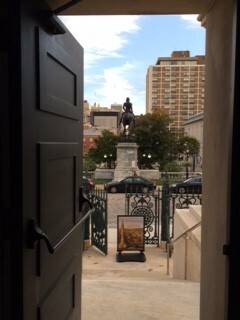 Looking out the door to the south, you can see a statue of Lafayette, the Frenchman who fought in the American Revolution and became a close friend of Washington, Alexander Hamilton and others. The church across the street also has amazing architecture – it makes quite backdrop. 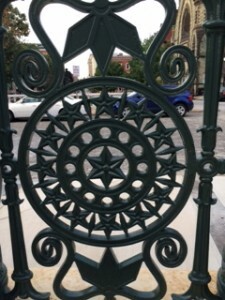 And scroll down to a picture of the stars on the gates, again such detail. Whether close up or far away, from the top or from the ground, Baltimore’s Washington Monument is a wonderful monument to our first president. Now that the renovation is complete, go see for yourself. You can check out our “On the Map” page for information on the address, hours, etc. 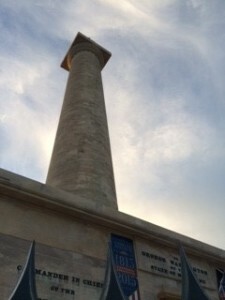 I have to admit…I didn’t even know there was a Washington Monument in Baltimore! Steve, you’ll have to come see it! 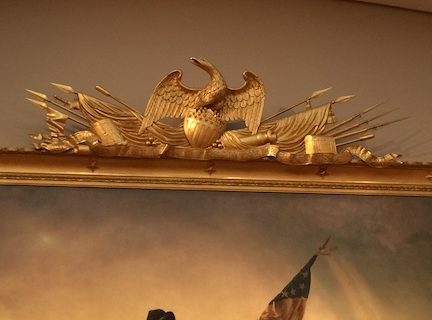 There is actually a statute of George Washington at the top. I was using my cell phone camera, so I couldn’t get a good shot of it. 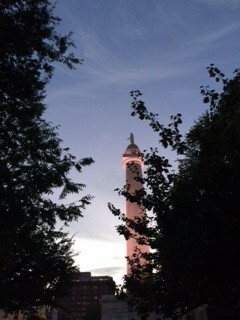 When I was a kid my father used to take me to the Washington Monument in Baltimore. It was always a special adventure. I remember the steps and the views. Frank, that’s great. I lived in Baltimore for 12 years before I finally went up. It is quite a hike! Went past it many times, but never toured it in my 5 years in Baltimore! I’m sure I would have found going up easier than coming down as well. Thanks for the visit and posts Sharon. 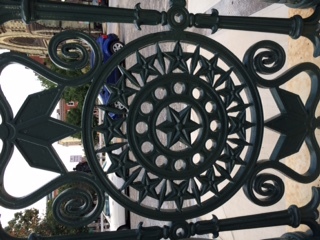 The Mount Vernon Place Conservancy is collecting “Monumental Memories” on our website for inclusion in our Bicentennial Time Capsule. We hope you or some of our blog followers enter your memories. Thanks Mount Vernon Place. I will look to add the blog post to your website. Thank you for all you do to preserve Mount Vernon!